As I mentioned the other day, we've tapped 4 of our Boxelder trees hoping to get enough sap to make syrup. Conditions are perfect for sap in our neck of the woods right now, with temperatures rising above freezing during the day, and dropping below freezing at night. Two days after placing the taps, we've collected almost a gallon of sap from two trees. A third has sap flowing, but the collector (aka milk carton) keeps blowing off the spile (aka ball-point pen shaft). All three of these trees are experiencing quite a bit of leakage around the spile because they're not tight in the holes, so the potential is there for much more sap to be collected (if you look back at that first picture, you'll see the sap leakage on the tree trunk). The fourth tap doesn't seem to have anything happening--we'll be moving that one soon. This is the sap. Yes, I know it looks like water. That's because it mostly is water. With a sugar concentration of just 2% or less, we estimate it'll take between 5 and 8 gallons of sap to yield 1 pint of syrup. That's between 80 and 128 cups of sap to make 2 cups of syrup. The next step is to concentrate the sap into syrup by evaporating off most of the water. Just look at all that steam--that's what we like to see! We started boiling, and that almost a gallon of sap is now, oh, around 1 cup of more concentrated sap. Much sweeter, but still not anywhere near where we'd like it to be in the end. We'll keep collecting and boiling as we go. Is it worth it, you ask? Especially considering you don't even like maple syrup, Scarlet, is it worth all the fuss? My answer is absolutely yes. This experiment in syruping has already been so much fun and so educational. Can't wait to see how it turns out! If you'd like more information, University of Cincinnati Clermont College has a terrific one page explanation of how to tap trees to make syrup. This has been kind of a strange holy week this year--probably because Easter is so early, it snuck up on me. Every now and then my thoughts stray back to that one week in history that changed everything. A few years ago, I blogged through holy week, and I do like to go back and read those posts again each year, so I thought you might like to as well. In February AKD, Hubby, and a bunch of other brave Boy Scouts headed out for SnowBase. I could say more, but I'll just let the pictures speak for themselves. The intrepid hikers set out into the snowy wilderness carrying all of their food and gear on their backs and in sleds. They hike for about an hour, until they come to their campsite for the night. The Scouts immediately set to work building their sleeping shelters by shoveling lots and lots of snow into a big pile. May I just say? I'm kind of jealous. I've always wanted to make a quinzhee. While the snow shelters sit and solidify, they boys head out for some fun. AKD used ice axes and crampons to climb this ice wall as high as it went. They boys stayed warm while waiting by cross country skiing. Back at camp, the shelter is solid, so the boys set to work shoveling out a door and a sleeping chamber inside. and settle in for a long winter's nap. Can I just say? While I have always wanted to build a quinzhee, I have little to no desire to actually sleep in one. Kudos, boys. it takes lots and lots of Boy Scouts to break down the quinzhee. The intrepid travelers have returned. And a fun time was had by all. Hurrah! So, the other day, I told y'all we were going to try tapping our boxelders and boiling the sap down to syrup. Well, my friends, I finally got to Fleet Farm on Friday to see if they had any spiles, aka maple taps, left. They didn't, so we had to get a little creative. Really, all you need is a tube for the sap to flow through. Hubby decided to try using these de-inked ink pens (that I got for free last fall during school supply season). He took the pen part out and tapered the end that goes into the tree (on the left in this pic--sorry you can't see it very well). He put a mark on the other side so we'd know which side was supposed to go up. If you really want to make your own spiles, do a google search--all sorts of creative people out there. First drill a 2.5-3 inch deep hole, the same diameter as your spile, at a slightly upward angle. 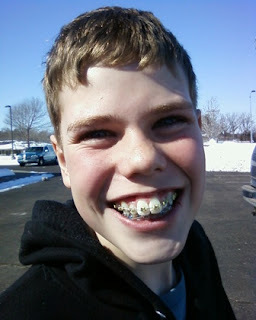 Look at that sap already flowing out! So exciting! Then, gently tap the spile into place. Very gently, in our case, since the plastic is quite brittle. Next, attach a collection bucket. It just needs to be able to hold enough liquid that it won't overflow in between emptying (the smaller the receptacle, the more often you need to empty them), and it should have a top to keep out insects and tree debris. We decided to use milk cartons, making our boxelder tapping project completely cost-free. Hubby tied a string to the handles and tapped a nail into the tree to hold the milk cartons in place. Boxelder syrup, coming right up! For more information on tapping trees and making syrup, check with your state's extension service. Or Tap My Trees seems to be a good source for information and supplies. Jesus is ________. How would you complete that sentence? In Jesus is________., author Judah Smith explores the nature of who and what Jesus is by filling in the blank with 6 different attributes, each revealing an aspect of the character of Jesus. The author dedicates three chapters to each of these fill-in-the-blank answers, unpacking each characteristic in a way that breeds a deepening understanding of Jesus, as well as a way to apply these truths to our relationship to Jesus, to our selves, and to the world. I really enjoyed this book. It would be an excellent book to read either on your own or with a small group, especially during Lent. It's easy to read and engaging. Judah Smith uses a conversational style, humor, and down to earth, contemporary language and examples to bring the stories of Jesus and those who knew him to life. The concepts are thought provoking and profound but extremely accessible. Whether you are a new believer, a lifelong Christ follower, or just curious, this book will enhance your understanding of what Jesus is all about. Jesus is more than just a man, more than even just a Savior. Jesus is life. Jesus is grace. Jesus is your friend. Thanks to BookSneeze.com for providing me with a free copy of Jesus is _______. for my review. I was not required to write a positive review, and all opinions are my own. To buy Jesus is ______., head on over to Amazon. There is also an 8 session DVD based small group study available. Click here for the kit, which includes the DVD, 1 leader guide and 1 participant guide. Click here for additional participant guides. Click here for additional DVDs. We went to a maple syrup workshop last weekend, something that I've been wanting to do for years. At least 2. Maybe 3. Years, that is. Anyway! We learned how to identify maple trees, how and when to tap them, how to collect the sap, and how to boil the sap down into syrup. It was a hands-on workshop, so we actually got to trek out into the sugar bush (through 2 feet of snow) and tap a couple of trees. It was so much fun. But it was also kinda sad because, you see, we don't have any maple trees. We have red and white pines, some firs and spruce, a couple of junipers, a weeping willow, and exactly two oak trees. We also have these other trees. I never knew what kind they were, but they're ugly, and kind of a nuisance, because they're always popping up in places where we don't want them, crowding out the trees we do want. And they grow so quickly. On the way home, Hubby and I were brainstorming ways to get our hands on maple sap. As in, maybe the state park near our home would let us tap their trees (although I'm not sure they have maples, either). Or maybe we could freecycle for it or put an add on Craigslist for maple sap. So one of the things we learned at the maple syrup workshop is that sugar maples aren't the only trees that can be tapped to make syrup. You can also tap silver maples and boxelders, because they're part of the maple family. Now these other trees, I never knew what they were, but the wheels in my brain were turning. Those trees have little helicopter seeds, so it would make sense for them to be a cousin to the maple. And those trees are where the boxelder beetles always hang out in the spring and fall (ahem, when the sap is flowing! ), so it would make sense for them to be boxelders. Why I never put that all together before now, I don't know, but my friends, when we returned home from our workshop, AKD and Bubby went out to check the bark of those nuisance trees against our tree bark identification pictures and...low and behold, we have several boxelders that are big enough to tap to make syrup. So we're going to try it. Are we crazy? I feel like maybe I need a disclaimer up here. Like, don't read this if you've just eaten. Or don't read this if you have a weak stomach or a vivid imagination. But let's be real. You read the title. You know this post is about vomit. If you are a mom (and most of you are), you are, by default, the chief vomit officer in your household. You've dealt with this live and in technicolor. Probably more than once. You can handle a few words on a computer screen. I call him the Stealth Vomiter, this child of mine. Have you ever heard of a kid who is able to throw up without needing to tell the whole world about it as soon as it happens? The Stealth Vomiter, he can barf, toss his cookies, bow before the porcelain throne, and if I'm not right there to see it happen, I would never know. Now, you might think this is a good thing, a child who can vomit discreetly, who doesn't need his mama to rub his back or offer him a drink. Less work for the mama, right? Less likely for the mama to be gagging and swallowing down those sulfur tasting burbs as she's "comforting" the child. Independent, self-sufficient child, right? But you would be wrong. Because the Stealth Vomiter has horrible aim (I think it's a result of his sensory challenges). I'll just be minding my own business, walking along, when suddenly, I will happen upon one of his puddles. I might not even know he had been feeling sick (because, apparently, he doesn't realize he's feeling sick until he starts spewing). If I'm lucky, it'll be somewhere like the couch, or his bed, or very occasionally, if it's not the first ralph of the day, in a bucket. My friends, when this child hits the bucket, I feel like I hit the lottery. Even if he still doesn't tell me about it and hours later I have to follow my nose to the jackpot. If I'm lucky, I don't look down to realize I just stepped into a big puddle of upchuck. With my bare feet. A loud crash sent me scurrying into Bubby's bedroom late Tuesday afternoon. I knew he was safe--he wasn't even in there--but I couldn't imagine what that noise had been. So it was with a feeling of trepidation that I turned the corner into the bedroom to investigate. I had been rearranging things in Bubby's closet earlier in the day, freeing up usable space by placing items higher up that we don't need to easily access. Some time after I left the room, the top shelf crashed down, causing the bottom shelf to fall as well. It should have been able to hold the weight. I thought it could hold even more than that. I was wrong. The top shelf is completely wedged in place about a foot and a half lower than it should be, and angled crazily. As in the top left corner and the bottom right corner of the shelf have gouged their way into the wall. I'm talking half an inch deep. On both sides. It is not pretty. I am not moving that thing without seriously damaging the wall even more than it already is. I wanted to cry. I just wanted to sit down right there in the middle of Bubby's fallen clothes and the miscellany scattered around on the closet floor, hang my head, and cry. But I didn't. I gave myself a pep talk, told myself I was strong enough to deal with this, and decided to do what I could and wait for help for the rest. The bottom shelf should have been easy to just slip right back into the bracket. It just fell straight down, after all. It's simple, really. Just angle it up, lining up the shelf with the holes in the bracket, and gently ease it back into place. But time and again that darn shelf fell. Just when I thought I finally had it. Five, nine, twelve times, I just kept trying. Oh, it was messy. Not quite throwing myself on the floor screaming while flailing my arms and legs, although I wanted to. Not quite throwing something, anything I could get my hands on as hard as I could. But it was not pretty. Loud, breathless, heart-broken sobs, tears flowing and snot streaming. Broken. I thought I could hold more weight than that. I was wrong. It's all so much, too much. Keeping the household running, the bills paid, the cupboard and refrigerator stocked, the driveway clear. Running the kids to Scouts and karate and church things, and the appointments! Good Lord, the doctor and dentist and orthodontist appointments! Caring for them when they're sick, attending their school functions, cleaning up after them. And doing it solo a good portion of the time. I. Am. Not. Strong enough. To hold that weight. I am not strong enough. I'm not. If I try to hold that weight on my own, I will always fail. And that, my friends, is why I need a savior. Someone strong enough to bear the weight of the world's sin on his whipped raw, bleeding and broken shoulders. Someone strong enough to hold the entirety of creation safe in his outstretched, pierced hands. He is strong enough, so I don't have to be. Though the shelves will fall, though the children will be sick, though the snowblower not start, though the days run together in an endless stream of busyness and tedium, I will not fear. For God, my strength and my song, is with me. It is Wednesday, isn't it? Feels like .... feels like I've dropped out of time completely. 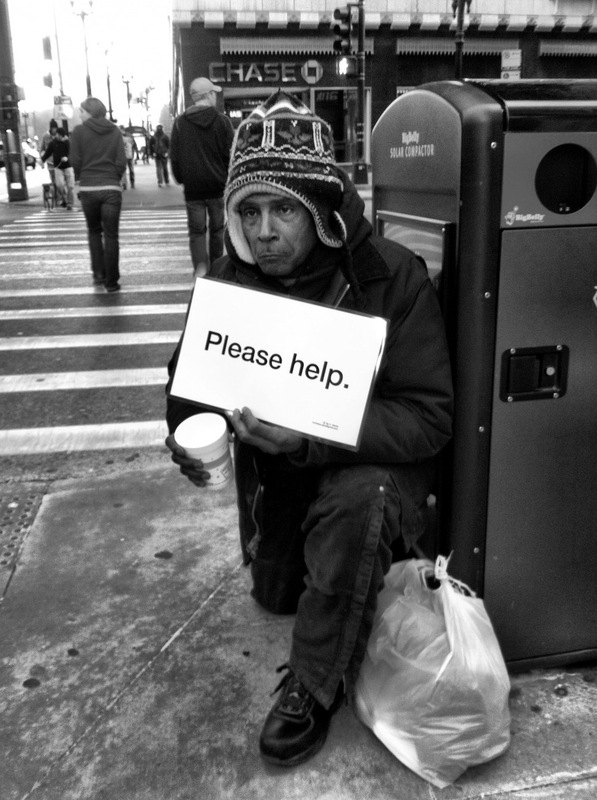 We don't see too many homeless people in our neck of the woods--we're pretty rural here, with a large metropolitan area not too far away. But every now and then, I'll see someone bundled up in what looks like all of the clothing he owns, standing at the top of the freeway off-ramp with a hand-lettered cardboard sign. And I want to help, because I am so blessed--blessed beyond measure--and, as a Christ follower, it's my job to help. Because I don't necessarily want to just give him money, and as a woman driving alone or with small children in my vehicle, I don't necessarily want to pick him up and take him somewhere for a warm meal either. So I decided to do a little something about that. Finally. I put together some Blessing Bags, with a few personal supplies and some snacks. I keep them in my car, and when I see someone in need, I'm prepared to help in a very practical but safe way. Really, it's a drop in the bucket, but this little bag of blessing can mean so much. I included a toothbrush, floss, and toothpaste, a bar of soap and trial size deodorant, band-aids, lip balm and cough drops, plus lotion and a razor. All of these items I got for free using coupons or by requesting free samples. I also included a few snacks. AKD and I handed out our first Blessing Bag a couple of weeks ago to a man standing at the intersection. He didn't know quite how to react as he looked from the bag to us and back to the bag again. The traffic cleared; I moved forward to turn, and as we drove away, he called out, "God bless you." Hello, friends. After yesterday's post whetted your appetite, I thought you might be in the mood for a few St. Patrick's Day crafts. 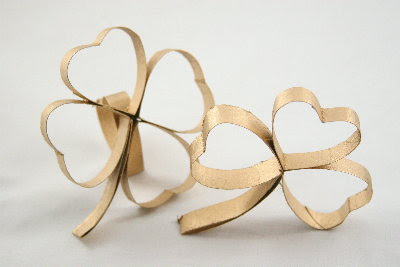 Don't worry--these are so simple you've got plenty of time to get your St. Patty's Day craft on before tomorrow. Remember, just click the pictures to see how to make 'em. 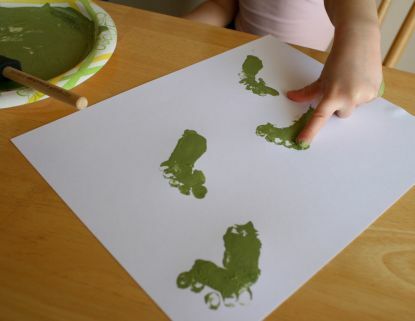 Let's start with these cute leprechaun footprints. Those sneaky green guys are always up to something! Maybe those footprints will lead you to the leprechaun's treasure at the end of the rainbow. Yes, I know this one isn't very pretty, but you should click on it anyway. Great learning opportunities right there. Symmetry, color mixing, physics. Seriously. Check it out. And I know yours will be much prettier because you will use higher quality paint. Did you know that St. Patrick is credited with driving all of the snakes out of Ireland? It's true. There are no snakes in Ireland. And people say St. Patrick is responsible. Let's just not dwell on the fact that there probably never were any snakes in Ireland, and make this cute little snake instead. Maybe your kids will even want to make a green one. Totally some great opportunities for scissor skills and patterning right there. 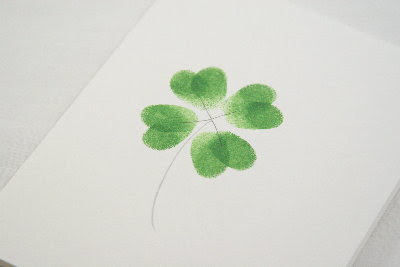 Legend has it that St. Patrick used a shamrock to illustrate the concept of the Trinity: one God in three persons. One leaf with three leaflets. So you can make one like this. Or using recycled TP tubes--don't forget to paint them green. And talk about St. Patrick. And God. 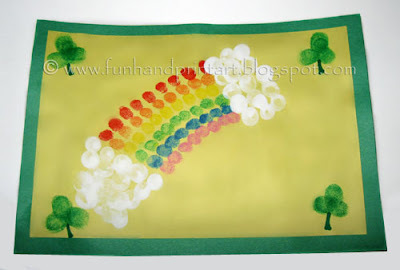 Happy St. Patrick's craft making! Everybody is Irish on St. Patrick's Day, and since it's coming up, I figured we needed some props around here. To accentuate our Irish-ness. So I recruited my friend J to come over and make some Leprechaun mustache straws with which to drink green drinks. Because that's what St. Patrick's Day is all about. Right? To make your own, just cut a mustache shape out of orange paper or craft foam--I printed out some mustache clip art for inspiration--then cut two slits in the middle so you can slip it on to a green straw. I picked these straws up on Amazon, but you can use any old straw you happen to have around. Whip up a batch of yummy homemade shamrock shakes (recipe here), and enjoy! To make it extra fancy, rim the glass with green sugar or give it a dollop of redi-whip and sprinkle shamrock decors on top. Or both. We weren't feeling extra fancy enough to actually go out and obtain these things, so we just went with the basics. I talk enough about chores and housework around here for you to know that this part of my job occupies much of my thoughts (and believe me, I don't have many thoughts to spare). A year or so ago, we decided to start giving our kids an allowance. Their allowance is not tied to their chores--they are expected to do their chores because they are a part of our family, and I didn't want to give them the option of saying they weren't going to do their chores because they didn't want the money that week. But I wanted them to start learning to handle money as well, hence the allowance. Since the institution of the allowance, we have always said that if our kids want extra money, they can earn it by doing chores beyond their normal, expected chores. It sounded good, but was problematic because we never had jobs at the ready for them to do when they asked us. And I've never been all that great at thinking on my feet (this is why I write instead of talk). Until now. I thought I'd share my solution with y'all. I made up these cute little 3x5 cards on the 'puter. Because it makes this whole endeavor seem more official, yes? On the front of the card, I write the job, how much it pays, and how much time I would expect it to take (that's $20 an hour, boys--snap this job right up). On the back of the card, I write out, step by step, what needs to be done for the job to be considered complete. The cards are tacked to our family message center, and when someone asks me what they can do to earn a little extra money, now I know where to send them. "I can do all things through Christ who strengthens me,"
but do you believe it? Really believe it? How about childbirth? Well, it was extremely painful, and I thought it was going to kill me, but I did that one 3 times. How about journeying through sickness or addiction or depression, either your own or a loved one? Yeah, OK, those things. Those I can do. Through Christ. Those are really hard things, but people do them every day. What about something that's really impossible? What about walking on water? Remember the time Peter walked on water? You can read about it in Matthew 14. The interesting part to me is that Peter was fine. Walking on the water. Not sinking. Not even a little bit. Until he took his eyes off Jesus. Let me say that again. Peter didn't start to sink until he stopped looking forward at Jesus and started looking around. walked on the water and came toward Jesus. He was doing it. Something impossible. But then his fear crowded out his faith and he couldn't anymore. Fear. I think fear is the single biggest reason we don't live the abundant life that God wants for us, that God has planned for us. And it is certainly the reason I'm not out right now doing the impossible. When I was a kid, I was a little annoying (be honest now, am I still a little annoying?). I was always the kid who would say, yes I can walk on water. You can walk on water, too. Ice is water. Annoying, right? So, OK, all of us can do something impossible, walk on water, under certain conditions. As people of faith, we know that if we stay focused on Jesus, not looking around, not letting fear take hold, and have faith, under those conditions, the impossible is very much possible. “Humanly speaking, it is impossible. I've been doing some looking around for Easter Crafts and decided to share some of them with you. Click the pictures for directions. Use construction paper, tissue paper, and contact paper to make this gorgeous empty cross suncatcher from Almost Unschoolers. Love this idea! Bury a terra cotta pot to make an empty tomb and plant grass on the hill. Here's another empty tomb craft if you're not feeling ambitious enough to make the planter above. Added bonus: you might just have everything on hand already to make this. Not really a craft, but we love getting out our Resurrection Eggs (thanks, Buckwheat!) every year to count down to Easter. Each egg has a symbol representing a part of the Resurrection story, along with a Bible verse or two to read. The booklet is in English and Spanish. Oooh, these Easter chicks are so cute, I just wanna squeeze 'em. Save your egg cartons to make your own. Which came first, the chicken or the egg? Well, in this post, anyway, the chicks :) Aren't these pretty? Steve Spangler explains how to make these "geode" eggs (it's alum crystals!). Cascarones are a Mexican tradition. 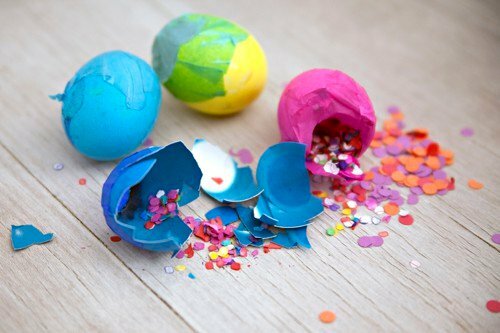 Fill the eggs with confetti, small toys, or candy and hide them. Celebrate Easter by smashing them over your head when you find one. The obligatory bunny craft. This website is written in a language that I don't understand, but these look fairly simple to put together. Again with a language I don't understand...but here's how to make lovely Easter eggs out of string or yarn. Amaze your kids by putting a few pieces of candy in the balloon before applying string that's been soaked in glue. When the string is dry, pop the balloon and fish it out. 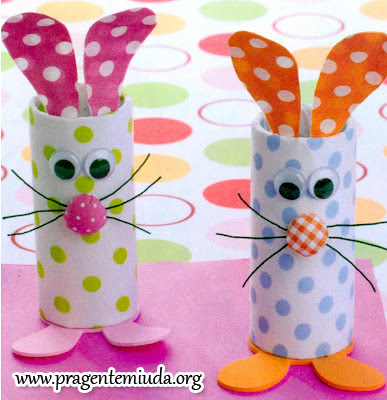 Click here for even more Easter crafts and activities from our archives. 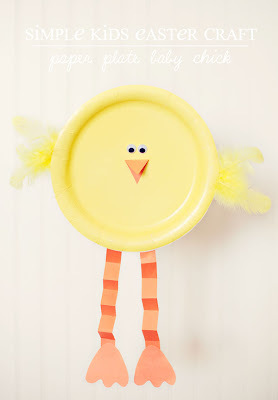 Click here for some cute Easter food-crafts.